Hi Sawyer, i use to own a clipper 24. Do you get a tick when you tilt 90 degrees down and when you tilt back up you find the fore and aft balance is out? That use to happen to me. It took a long time to track down how ever we finally discovered what it was. I do not fully understand what I am writing but maybe the tiffen people will. The “blocks” in the top stage had a 1/10000 inch of compression that was causing the problem. It really only showed up with longer camera set ups. The weight block they used at the shop was not re-creating the problem however when you had a Sony F900 with all the stuff on the problem was there. They eventually replaced the blocks with a new metal for me. This was in 2008 I’m no longer flying that sled. Hope me that helps. Feel free to call me if you have any more questions. Hi I'm selling a wireless HDSDI system. This is the Bolt Pro HDSDI only (NO HDMI) Package includes 1- TX 2- RX 1- TV logic 5.6" HD monitor (has both SDI and HDMI but does NOT convert from one to the other) 1- custom cage for a receiver mounted to the monitor 6- L series batteries 2- Chargers 3- PTap to 2 pin power 1- 2pin to 2 pin short cable for monitor 2- mini xls to PTap power for monitor $2,500.00 for the complete package. Tough to say I've only had the 703 for a week, I've had a transvideo for years. I need to have the 703 Out in the field longer to say. The price points are very different. Both totally do the job. The built in level on the transvideo is nice. I have he XCS digital level so I do not need a level built into the monitor. I like the 703 for the low light work I've been doing at night. I find both the transvideo and cinetronic are great during the day but are hard to see at night, the way people are lighting these digital days. I've been using the 703 with the yoke for the past week and I'm happy with it. I have not noticed any delay other then the one that always comes out of the RED Dragon to any monitor other then the touch screen. It's a nice image we are going to run into the problem of DP's and Directors looking over are shoulder at it. The screen is reflective I'm tempted to put an iPad anti glare screen protector on it but I have not yet. I have been outside in sun and overcast this past week in the tri-state area and out of the box it has been good enough for me to see in all situations. I wish all monitors were water resistant because I hate rain covers. But this one is not. There is not a way to turn off the image flip so when going to low mode the quick and dirty way requires the push of a few buttons. I have spoke to Small HD and they are looking into a fix for it. All and all I'm happy with the monitor. I'm torn between buying the 503 to mount to the 15mm rods on the camera for low mode shots or buying a 2nd 703 so my back up monitor is exactly the same. 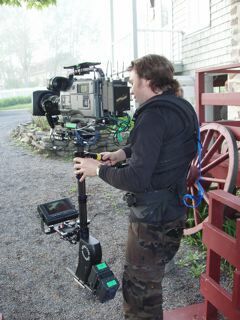 I still have my cinetronic gen2 and the Steadicam/transvideo 8" high bright backing me up right now. How does this monitor do at night with very low light? I use the Cinetronic gen 2 which is great in day light how ever working wide open at night in LOW light situations I need some help seeing anything but shapes. Can this monitor have a LUT loaded onto it?